There are many types of back injuries, including acute and chronic problems, and repetitive injuries due to use of the horse. A horse with a painful back is often reluctant to work under saddle, since certain movements hurt, and he may become grumpy. Many back problems show up first as a change in performance and/or attitude. It may be subtle to start with, but the horse is not performing as well as he was earlier. He may be irritable, resenting the weight of a rider, or not traveling straight, or maybe just “off” from his normal performance. He may demonstrate discomfort when his back is palpated or groomed. Some horses show soreness in the saddle area, or behind the saddle as far back as the top of the croup, when experiencing primary back pain. 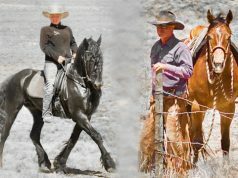 Resistance to saddling or tightening the girth may also be a sign of back pain. Dr. Tia Nelson, a veterinarian/farrier at Helena, Montana, says back problems can include a wide spectrum of situations and present a variety of signs. 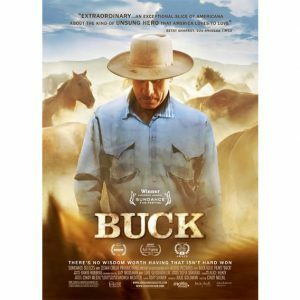 “The horse may suddenly change behavior or start bucking. He may be reluctant to take a certain lead, or reluctant to run, or refuse to jump. He may be stiff when turning, or may not want to go downhill if he’s ridden cross-country. A sore back can be very inhibiting for any athletic horse,” she says. 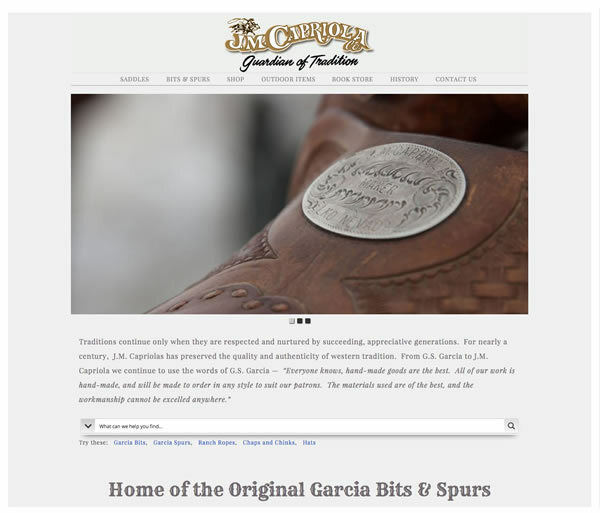 “Some horses resent being saddled because they know the saddle will cause more pain. They become cold-backed or sour about having a saddle put on, or having a rider get on. Pinpointing the problem can sometimes be a challenge, however,” says Nelson. 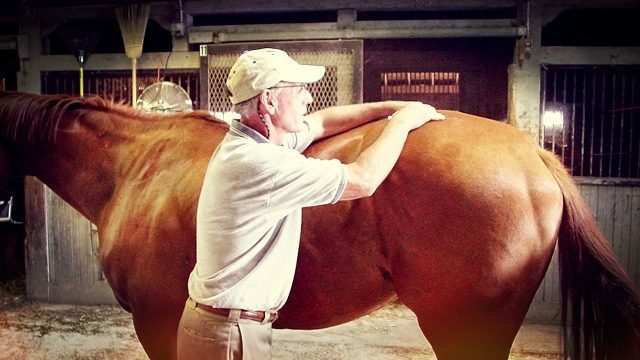 The horse’s back is long, with many regions at risk for injury, strain and pain. “I see a lot of lower back pain due to strain. Back pain can be something as simple as improper saddle fit or as complicated as being kicked or wrenching the back when slipping/falling, or just putting a foot wrong. The back can be injured if a tied horse pulls back and the rope breaks and he tumbles backward,” says Nelson. “If front feet are too long in the toe, with or without underrun heels, his lower back may show compensatory pain. If one part of your body hurts, you try to protect it by taking the weight off that part. A horse trying to put less weight on the heels of his front feet will be using his lower lumbar spine too much, trying to shift more weight to the rear legs. A lot of horses that are back sore are actually foot sore. As soon as we correct the foot issues, the back pain resolves,” she says. It’s important to determine the cause so you can try to eliminate or treat it. 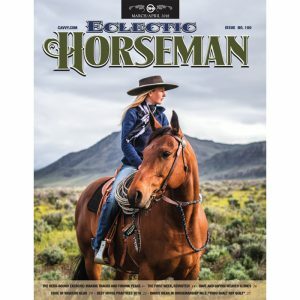 “If it’s a poorly-fitting saddle, this is something we can fix, but how quickly may depend on how long the horse has been ridden with the poorly-fitting saddle,” says Nelson. 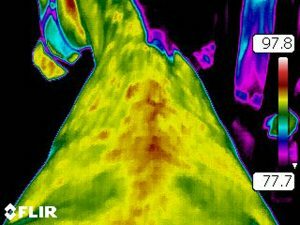 Kent Allen, DVM, Middleburg, Virginia (Virginia Equine Imaging), says back problems are more common than most riders realize. “The horses with back pain often present as avoidance behavior or a performance/training problem. The horse is trying to avoid what you want him to do, because it hurts,” says Allen. DIAGNOSIS – For proper diagnosis it is important to have a clinical examination, and a complete history. “We need to know if the horse has avoidance behavior or reduced performance. Does he refuse to jump or won’t jump the way he used to? Does he run slower, or run wide on the turns?” asks Allen. 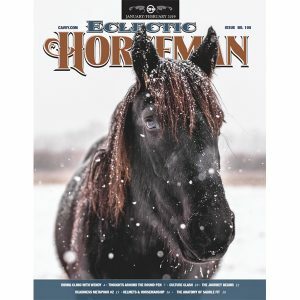 “There’s a wide variety of performance/avoidance behavior issues and these are sometimes hard to pick up if you don’t know the horse’s history or you are not looking for it. Horses with back problems often present as girthy; they don’t like being tacked up. They do better once they are warmed up, but you may start seeing performance problems that you never saw before. Horses with back pain often refuse to do something they’ve done hundreds of times. The rider may not understand why they suddenly start refusing to do what they are asked to do. They don’t want to do it because they know it’s going to hurt,” he says. “Often it’s hard to tell whether it’s a mental problem or a physical problem. But the good news is that it’s easier to figure out a physical problem than a mental problem.” If you can fix the physical problem and the horse performs well again, you know it’s not a mental/training problem. 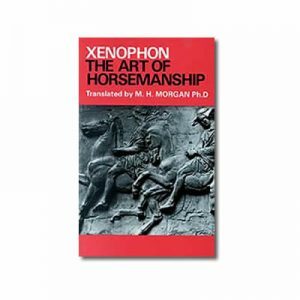 A good history of the horse can be a starting point. It is important to be able to differentiate between muscular pain and bony pain. “Sometimes you can’t, because it runs together; the whole back may be so sore that you can’t separate it out. You also have to palpate the lumbosacral joint (the front part of the sacroiliac joint),” Allen says. “Then you watch the horse move. We have to realize that lameness may be a separate issue. The horse can have back pain from something like kissing spines or osteoarthritis of the dorsal articular processes and also have navicular disease or sore hocks.” The back soreness and the lameness may not be related. Dr. Tim Holt, Colorado State University, works with many horses that come into the large animal hospital with lameness issues. “We’ve found that about 80% of lame horses have back pain as well. Often we can take care of the lameness, but the horse still doesn’t want to perform. So we look more closely to try to figure out why they still have pain and don’t want to work,” he says. “We start looking for sore muscles and also check the facet joints. 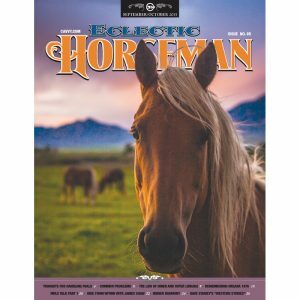 The horse has many small joints along the backbone—several between each vertebrae,” he says. 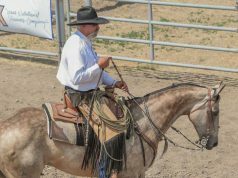 These horses have usually gone through the entire traditional lameness workup with nerve blocks, palpation, etc. “I am usually called in when that doesn’t lead to a diagnosis and people still can’t figure out the lameness problem,” says Holt. He tries to pinpoint the problem and then rehabilitate the horses, via acupuncture and chiropractic manipulations. This type of examination–and assessing the most important acupuncture points–can help identify pathology (showing regions of pain or loss of motion) in specific areas of the body, and determine which points may be needed for specific treatments. A thorough evaluation utilizes pressure, palpation and touch of more than 200 diagnostic acupuncture points, observing the horse’s reaction. There may be painful areas due to restricted motion in a certain joint or joints. The back has several sections, with different types of vertebrae in each section. There are 18 vertebral bodies in the thoracic area, for instance. “Each of those has 12 different facet joints. 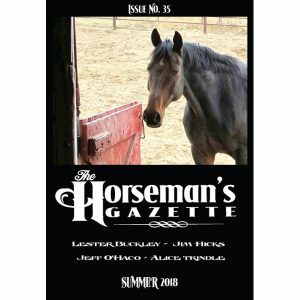 There are about 360 small joints in the horse’s back,” Holt says. It’s no wonder the horse suffers back pain at times. 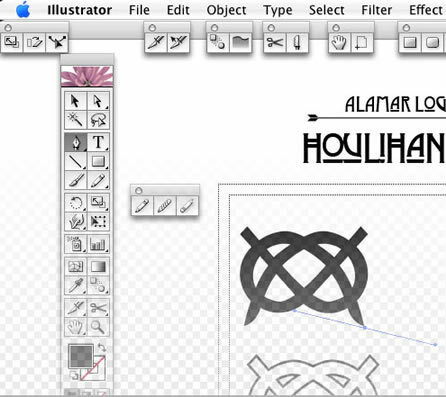 “I try to isolate joints in the back that are not moving correctly. If there is even one joint that is not moving, the one in front of it and the one behind it have to work overtime to compensate. Then the muscles around it get sore. My job is to find that spot and try to stimulate that joint to move correctly,” says Holt. 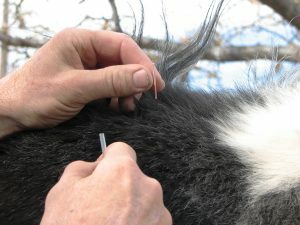 Dr. Bruce Connally performs accupuncture. 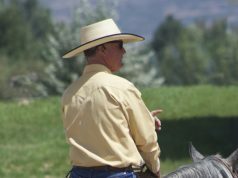 Dr. Bruce Connally has an equine sports medicine practice in Berthoud, Colorado and says it’s not always easy to determine the cause of back pain, or whether the pain is actually due to back injury or is secondary to a problem somewhere else in the body. “Sometimes the problem might be in a foot or leg and the back pain is secondary. Or, we do a flexion test on a hind leg and the horse tests positive so we think it’s the leg. But flexion tests also put a twist on the back. It can sometime be a challenge to get an accurate diagnosis with back pain,” he says. “Many horses with back pain will respond to touch/pressure along the back, if you palpate the lumbar muscles. These horses will either tense up to try to protect themselves from that touch, or sink downward to try to get away from it. Some will tense upward if you touch the tips of the spines of the vertebrae. This might be indicative of kissing spines, where the spines of the vertebrae are bumping against each other,” says Connally. Back pain is often due to something we can’t see anatomically, while in some cases it is obvious–if the horse has a hump or a crooked back. “If you stand behind and above some of these horses (maybe standing on a fence), you might be able to detect a crooked spine,” he says. Many back injuries in humans involve herniated disks, pinched nerves, etc. “We don’t see as much of these issues in horses, possibly because they have a horizontal backbone,” he says. There is more strain/stress on the human back, with upright posture. We can’t always assume that horses have the same kind of back problems humans do. TREATING BACK PAIN – Nelson uses a variety of treatments, including chiropractic manipulations and acupuncture. “There are some sore-backed horses whose owners ask me to do chiropractic or acupuncture on them, that I know are sore from feet issues.” For these she tries to address the hoof imbalances before she works on the back with acupuncture or chiropractic manipulations. “If it’s a muscle problem, acupuncture seems to help. Sometimes I also use non-steroidal anti-inflammatory drugs on a back injury (to help relieve swelling, inflammation and pain) and sometimes I use steroids. It’s important to identify the problem and figure out if it’s an acute injury or a chronic problem. With some horses it can be difficult to resolve an old chronic injury. After a time, however, it may be possible to make the horse more comfortable. I discuss this with the client and try to determine what we can actually expect, for that horse,” she says. CAUSES OF BACK PROBLEMS IN HORSES – A lot of problems are blamed on poor-fitting saddles that have nothing to do with saddles,” says Allen. 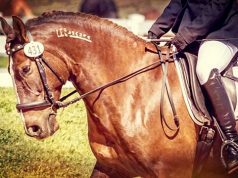 “Back soreness from a poorly-fitting saddle can occur, and usually you can see the saddle is rubbing and the horse is sore on either side of the withers. Farther down the back, many problems are attributed to saddle fit but are not,” he says. “Muscle soreness is a common cause. The horse may have overworked certain muscles and developed muscular spasms. These horses often hold their back rigid. A spasmed muscle atrophies. We can examine the horse and tell it has a back problem, just from the atrophy,” Allen says. “Muscle soreness is unrelated to any bony problems. If you rule out bony problems and the horse has mild back pain that comes and goes, it could be muscle soreness. This can be treated with alternative therapies (acupuncture, chiropractic, etc.) as effectively as any medical treatments,” Allen says. 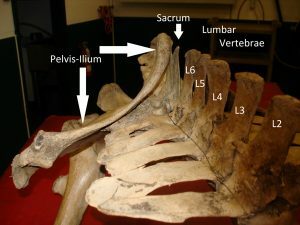 On the sides of the vertebrae (close to where the ribs attach), where the lumbar processes articulate, there are joints at the dorsal articular process. One or more of these joints can be arthritic, and not cause a problem until later. 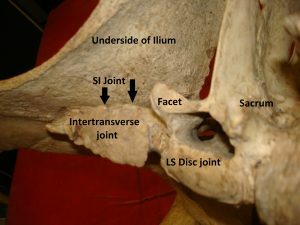 “This osteoarthritis of the dorsal articular process is the number two bony back problem in horses,” Allen says. “Number three is spondylitis. This occurs near the far end of the vertebral column and may have the closest analogy to human back pain (where the lower back meets the sacrum). Fusion may occur between those vertebrae. There may be big bony spurs occurring across them at the bottom. In horses it is the least common of the primary bony issues, but it can be dealt with and the horses can continue to perform successfully,” says Allen. 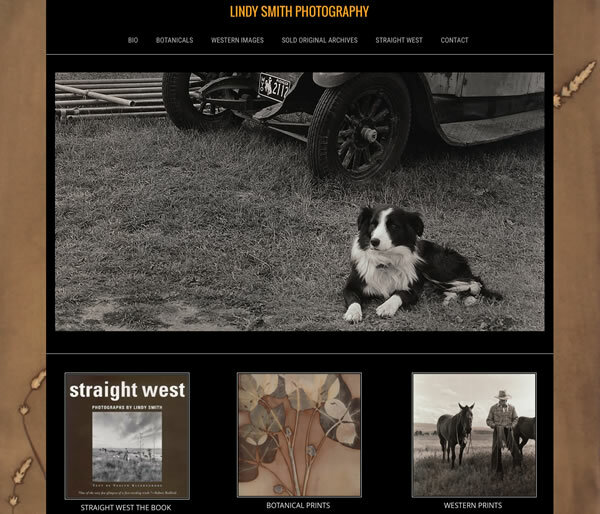 Heather Smith Thomas grew up on a ranch near Salmon, Idaho. She is the author of 20 books and thousands of articles on animal health care. 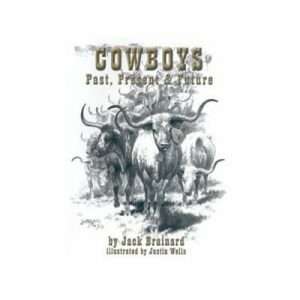 Her books include Essential Guide to Calving, Getting Started with Beef & Dairy Cattle. 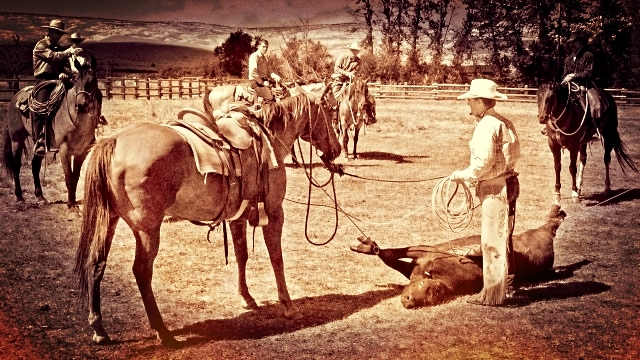 She and her husband Lynn Thomas have been raising beef cattle and a few horses on their ranch in central Idaho since 1967.